He holds the Josey Regental Chair in Science at the University of Texas at Austin, where he is a member of the Physics and Astronomy Departments. His research on elementary particles and cosmology has been honored with numerous prizes and awards, including in 1979 the Nobel Prize in Physics and in 1991 the National Medal of Science. In 2004 he received the Benjamin Franklin Medal of the American Philosophical Society, with a citation that said he is "considered by many to be the preeminent theoretical physicist alive in the world today." He has been elected to the US National Academy of Sciences and Britain's Royal Society, as well as to the American Philosophical Society and the American Academy of Arts and Sciences. 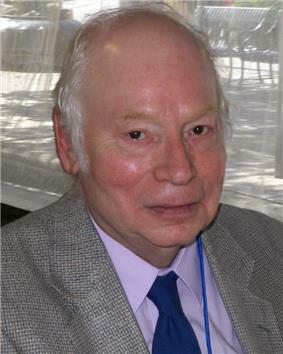 Steven Weinberg was born in 1933 in New York City, his parents were Jewish immigrants. He graduated from Bronx High School of Science in 1950. He was in the same graduating class as Sheldon Glashow, whose own research, independent of Weinberg's, would result in them (and Abdus Salam) sharing the same 1979 Nobel in Physics (see below). Weinberg received his bachelor's degree from Cornell University in 1954, living at the Cornell branch of the Telluride Association. He left Cornell and went to the Niels Bohr Institute in Copenhagen where he started his graduate studies and research. After one year, Weinberg returned to Princeton University where he earned his PhD degree in physics in 1957, studying under Sam Treiman. Weinberg is an atheist. After completing his PhD, Weinberg worked as a post-doctoral researcher at Columbia University (1957–1959) and University of California, Berkeley (1959) and then he was promoted to faculty at Berkeley (1960–1966). He did research in a variety of topics of particle physics, such as the high energy behavior of quantum field theory, symmetry breaking, pion scattering, infrared photons and quantum gravity. It was also during this time that he developed the approach to quantum field theory that is described in the first chapters of his book The Quantum Theory of Fields and started to write his textbook Gravitation and Cosmology. Both textbooks, perhaps especially the second, are among the most influential texts in the scientific community in their subjects. In 1966, Weinberg left Berkeley and accepted a lecturer position at Harvard. In 1967 he was a visiting professor at MIT. It was in that year at MIT that Weinberg proposed his model of unification of electromagnetism and of nuclear weak forces (such as those involved in beta-decay and kaon-decay), with the masses of the force-carriers of the weak part of the interaction being explained by spontaneous symmetry breaking. One of its fundamental aspects was the prediction of the existence of the Higgs boson. Weinberg's model, now known as the electroweak unification theory, had the same symmetry structure as that proposed by Glashow in 1961: hence both models included the then-unknown weak interaction mechanism between leptons, known as neutral current and mediated by the Z boson. The 1973 experimental discovery of weak neutral currents (mediated by this Z boson) was one verification of the electroweak unification. The paper by Weinberg in which he presented this theory was one of the most cited theoretical works ever in high energy physics as of 2009. "'Religion is an insult to human dignity. With or without it you would have good people doing good things and evil people doing evil things. But for good people to do evil things, that takes religion." "Frederick Douglass told in his Narrative how his condition as a slave became worse when his master underwent a religious conversion that allowed him to justify slavery as the punishment of the children of Ham. Mark Twain described his mother as a genuinely good person, whose soft heart pitied even Satan, but who had no doubt about the legitimacy of slavery, because in years of living in antebellum Missouri she had never heard any sermon opposing slavery, but only countless sermons preaching that slavery was God's will. With or without religion, good people can behave well and bad people can do evil; but for good people to do evil – that takes religion." "The more the universe seems comprehensible, the more it (also) seems pointless." He attended and was a speaker at the Beyond Belief symposium in November 2006. Weinberg, S (1967). "A Model of Leptons" (PDF). Phys. Rev. Lett. 19: 1264–1266. Weinberg, S (2010). "Pions in Large N Quantum Chromodynamics". Phys. Rev. Lett. 105: 261601. Weinberg, S (2012). "Collapse of the State Vector". Phys. Rev. A 85: 062116. ^ A partial list of this work is: Weinberg, S. (1960). "High-Energy Behavior in Quantum Field Theory". Phys. Rev. 118 (3): 838–849. ^ Weinberg, S. (1964). "Feynman Rules for Any spin". Phys. Rev. 133 (5B): B1318–B1332. ^ Weinberg, S. (1967). "A Model of Leptons" (PDF). Phys. Rev. Lett. 19 (21): 1264–1266. 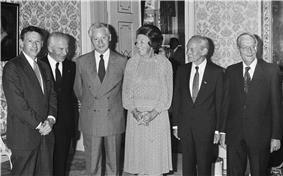 ^ Weinberg, S. (1979). "Phenomenological Lagrangians". Physica 96: 327. ^ Donoghue, J. F. (1994). "General relativity as an effective field theory: The leading quantum corrections". Phys. Rev. D 50 (6): 3874. ^ Weinberg, S. (1976). "Implications of dynamical symmetry breaking". Phys. Rev. D 13 (4): 974–996. ^ In 2006 Weinberg had the second highest creativity index among physicists World's most creative physicist revealed. physicsworld.com (June 17, 2006). ^ Articles by Steven Weinberg. New York Review of Books. Nybooks.com. Retrieved on 2012-07-27. ^ "Nobel laureate cancels London trip due to anti-Semitism". YNet News Jewish Daily. May 24, 2007. Retrieved 2007-06-01. ^ Walter, Claire (1982). Winners, the blue ribbon encyclopedia of awards. Facts on File Inc. p. 438. ^ "Weinberg awarded Oppenheimer Prize". Physics Today (American Institute of Physics). March 1973. 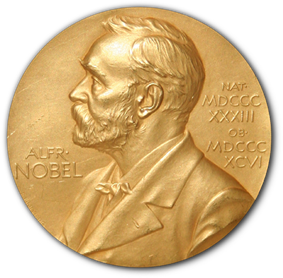 ^ "Benjamin Franklin Medal for Distinguished Achievement in the Sciences Recipients". ^ Sethi, Savdeep (2002). , by Steven Weinberg"The quantum theory of fields. III Supersymmetry"Review: (PDF). Bull. Amer. Math. Soc. (N.S.) 39 (3): 433–439.